Donat immediately fell in love with her and one week later they were married in Los Angeles. 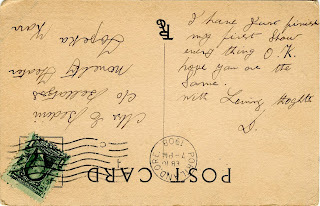 Based on the postmarks, it appears the courtship was quick, but the time that elapsed was closer to a month. They were married on January 21st. They formed a double act with the dogs and did Russian dances and as a team played together for twenty five years. 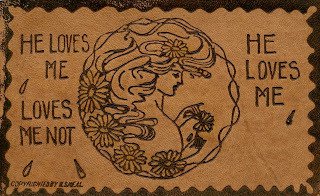 While the statement is true, it condenses a tale of true love that should be told. 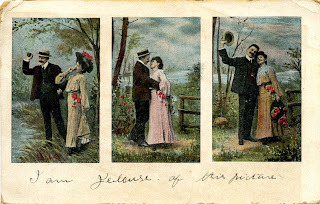 If indeed, absence makes the heart grow fonder, the young couple were about to find out. 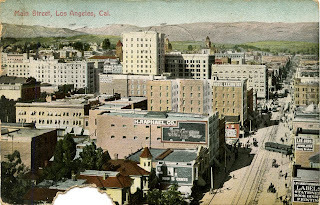 A card postmarked Los Angeles on January 28, was sent to Miss Ella Bellatzer Bedini. 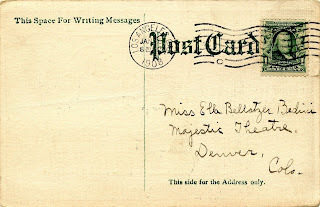 Featuring the name "Bedini" written next to the groom and "Ella" written next to the bride, it was sent to Denver - the next stop on the Bellatzer's tour. It was sent to him at the Grand Theatre in Reno, Nevada, where he was scheduled to play. 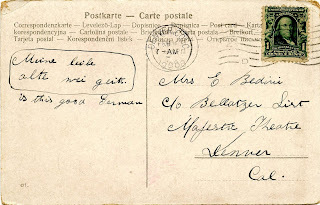 Note the tilt of the stamp. 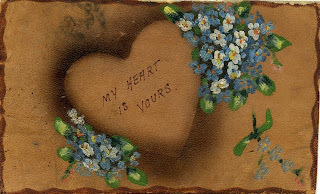 En route to Reno, Donat sent the following card, postmarked January 30 in Plano, California, with a reference to her heritage. 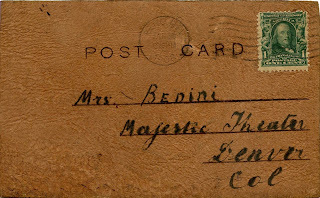 He then sent a leather postcard to his new bride once he arrived in Reno, later in the day. 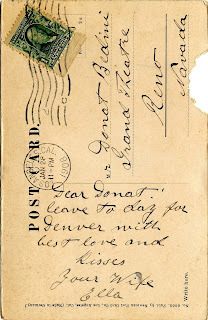 On February 8, his bride dropped a matching postcard, featuring artwork by the same postcard artist, to Donat from Denver. It was addressed to him in care of the Pantages Theater in Portland, Oregon, his next stop on the tour. 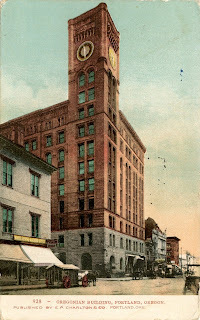 A postcard, not in the collection, shows the theater in Portland. Donat may have thought this was his Valentine from his bride. 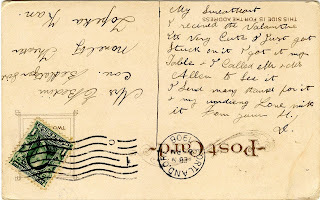 He was touched, and responded with the following card, postmarked February 9 from Portland. 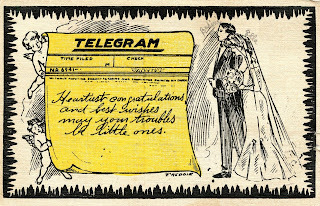 Ella and her family were headed east, with the next stop in Topeka, Kansas, and he addressed it accordingly. Note the stamp. 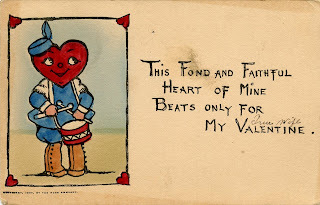 Following his first performance at the Pantages, Donat prepared his Valentine's Day card for his wife. It is postmarked February 10. 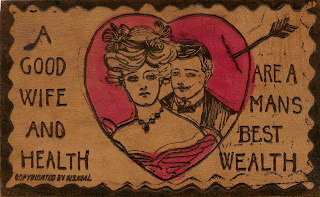 She followed up with yet another leather card, postmarked on the 13th of Feburary and sent from Denver. This may have been the card she intended as her Valentine gift to her husband. Next, Donat played shows in Seattle. He was headed to Canada.